3.8 দ্বিতীয় বিশ্বযুদ্ধ আৰু "ভাৰত ত্যাগ আন্দোলন"
"বন্ধু আৰু সহযোদ্ধাসকল, আমাৰ জীৱনৰপৰা পোহৰ হেৰাই গৈছে, আৰু এতিয়া সকলোতে অন্ধকাৰ, আৰু মই প্ৰকৃততে নাজানো আপোনালোকক কি কওঁ আৰু কেনেকৈ কওঁ। আমাৰ মৰমৰ নেতা যাক আমি বাপু বুলি মাতোঁ, আমাৰ জাতিৰ পিতা এতিয়া আৰু নাই। হয়তো মই এনেদৰে কোৱা অনুচিত, কিন্তু আমি তেখেতক আগতে যেনেদৰে দেখিছিলোঁ তেনেদৰে আৰু দেখা নাপাম, কিবা উপদেশ বা সান্ত্বনা বিচাৰি আমি আৰু তেখেতৰ ওচৰলৈ দৌৰি নাযাম, আৰু ই এক মোক্ষম আঘাত, অকল মোৰ কাৰণেই নহয় এই দেশৰ লাখ লাখ মানুহৰ কাৰণে।"
অহিংসাৰ ধাৰণা হিন্দু ধৰ্মীয় চিন্তাধাৰাত পুৰণি কালৰপৰা আছে আৰু বৌদ্ধ, জৈন, ইহুদি আৰু খ্ৰীষ্টিয়ান ধৰ্মীয় চিন্তাধাৰাতো ইয়াৰ নিদৰ্শন পোৱা যায়। গান্ধীয়ে তেওঁৰ জীৱনীত কৈছে: "যেতিয়া মই হতাশ হওঁ, তেতিয়া মই স্মৰণ কৰোঁ যে সমগ্ৰ ইতিহাসত সত্য আৰু ভালৰ জয় হৈ আহিছে। দুঃশাসক আৰু হত্যাকাৰীসকল কোনো সময়ত অপৰাজেয় হ'লেও অৱশেষত তেওঁলোকৰ পতন ঘটে আৰু এই কথা সদায় মনত ৰখা উচিত।"
↑ Gandhi, "The Momentous Issue", Young India, 10 November 1921, in Collected Works of Mahatma Gandhi, electronic edition,vol. 25, pp. 76–8; and letter to P. Kodanda Rao, 10 September 1935, in Collected Works of Mahatma Gandhi, electronic edition,vol. 67, p. 400, where he stated: "... I found that even civil disobedience failed to convey the full meaning of the struggle. I therefore adopted the phrase civil resistance." ↑ an honorific first applied to him byRabindranath Tagore). Bhattacharya, Sabyasachi (1997). The Mahatma and the Poet. প্ৰকাশক New Delhi: National Book Trust, India. p. 1. ↑ Gandhi means "grocer" in Gujarati (L. R. Gala, Popular Combined Dictionary, English-English-Gujarati & Gujarati-Gujarati-English, Navneet), or "perfumer" in Hindi (Bhargava's Standard Illustrated Dictionary Hindi-English). ↑ Fischer, Louis (1954). Gandhi:His life and message for the world. Mentor. ↑ Sannuti, Arun. "Vegetarianism: The Road to Satyagraha". International Vegetarian Union (IVU). 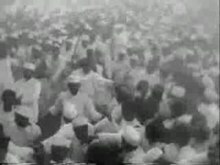 http://www.ivu.org/history/gandhi/road.html. ↑ 6.0 6.1 Brown, (1991). ↑ 7.0 7.1 Tendulkar (1951). ↑ Herman, (2010). p. 137. ↑ Gandhi, Rajmohan (2006), pp. 108–109. ↑ 18.0 18.1 Desai, (1930). ↑ 43.0 43.1 Roberts, (2011). ↑ Coward, (2003). pp. 52–53. ↑ Gandhi 1990, পৃষ্ঠা. 230–232. ↑ Jones & Ryan (2007). p. 160. ↑ Johnson, Richard L. (2006). Gandhi's Experiments With Truth: Essential Writings By And About Mahatma Gandhi. Lexington Books. পৃষ্ঠা. 11. ISBN 978-0-7391-1143-7. http://books.google.com/books?id=dRQcKsx-YgQC&pg=PR11। আহৰণ কৰা হৈছে: 9 May 2012. ↑ Watson, I. Bruce (1977). "Satyagraha: The Gandhian Synthesis". Journal of Indian History খণ্ড 55 (1/2): 325–335. ↑ Parel, Anthony (10 August 2006). Gandhi's philosophy and the quest for harmony. Cambridge University Press. পৃষ্ঠা. 195. ISBN 978-0-521-86715-3. http://books.google.com/books?id=MQhz0fW0HZUC&pg=PA195। আহৰণ কৰা হৈছে: 13 January 2012. ↑ A shorter edition, omitting the bulk of Desai's additional commentary, has been published as: Anasaktiyoga: The Gospel of Selfless Action. Jim Rankin, editor. The author is listed as M.K. Gandhi; Mahadev Desai, translator. (Dry Bones Press, San Francisco, 1998) ISBN 1-883938-47-3. ↑ Gandhi, M. K. (English; trans. from Gujarati ভাষাত). Unto this Last: A paraphrase. প্ৰকাশক Ahmedabad: Navajivan Publishing House. ISBN 81-7229-076-4. http://www.forget-me.net/en/Gandhi/untothislast.pdf. ↑ "Gandhi Behind the Mask of Divinity". http://www.sikhspectrum.com/082004/gandhi_mask.htm। আহৰণ কৰা হৈছে: 2007-12-17. Bondurant, Joan Valérie (1971). Conquest of violence: the Gandhian philosophy of conflict. University of California Press. GGKEY:NDWFBERN9B5. http://books.google.com/books?id=4hcf8jPrSKYC। আহৰণ কৰা হৈছে: 7 February 2012. Brown, Judith M. (25 October 1974). Gandhi's Rise to Power: Indian Politics 1915-1922. Cambridge University Press. ISBN 978-0-521-09873-1. http://books.google.com/books?id=HUo4AAAAIAAJ। আহৰণ কৰা হৈছে: 25 February 2012. Brown, Judith Margaret (23 October 1991). Gandhi: Prisoner of Hope. Yale University Press. ISBN 978-0-300-05125-4. http://books.google.com/books?id=boDAE8MLAJMC। আহৰণ কৰা হৈছে: 13 January 2012. Brown, Judith M.; Parel, Anthony (21 February 2011). The Cambridge Companion to Gandhi. Cambridge University Press. ISBN 978-0-521-13345-6. http://books.google.com/books?id=KLM8kMZZu-IC। আহৰণ কৰা হৈছে: 7 February 2012. Chadha, Yogesh (1997). Gandhi: a life (Illustrated, reprint সম্পাদনা). John Wiley. ISBN 978-0-471-24378-6. http://books.google.com/books?id=vSduAAAAMAAJ। আহৰণ কৰা হৈছে: 8 February 2012. Harold G. Coward (2003). Indian critiques of Gandhi. SUNY Press. ISBN 978-0-7914-5910-2. http://books.google.com/books?id=GGGudMuE4PIC। আহৰণ কৰা হৈছে: 11 February 2012. Desai, Mahadev Haribhai (1930). "Preface". 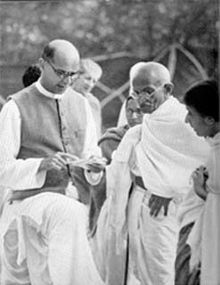 Day-to-day with Gandhi: secretary's diary. Hemantkumar Nilkanth (translation). Sarva Seva Sangh Prakashan. Archived from the original on 3 June 2007. http://www.wikilivres.ca/wiki/Day_to_Day_with_Gandhi/Volume_1/Preface। আহৰণ কৰা হৈছে: 16 January 2012. Easwaran, Eknath (1 August 1997). Gandhi, the man: the story of his transformation. Nilgiri Press. ISBN 978-0-915132-96-6. http://books.google.com/books?id=v_hpUlMRjWsC। আহৰণ কৰা হৈছে: 8 February 2012. Fischer, Louis (4 August 1997). The life of Mahatma Gandhi. HarperCollins. ISBN 978-0-00-638887-6. Gandhi, Rajmohan (2006). Gandhi: the man, his people, and the empire. University of California Press. ISBN 978-0-520-25570-8. http://books.google.co.in/books?id=FauJL7LKXmkC। আহৰণ কৰা হৈছে: 7 February 2012. Gangrade, K.D. (1 January 2004). "Role of Shanti Sainiks in the Global Race for Armaments". Moral Lessons From Gandhi S Autobiography And Other Essays. Concept Publishing Company. ISBN 978-81-8069-084-6. http://books.google.com/books?id=UODB6R_LmWsC। আহৰণ কৰা হৈছে: 11 January 2012. Hardiman, David (2003). Gandhi in his time and ours: the global legacy of his ideas. C. Hurst & Co.. ISBN 978-1-85065-711-8. http://books.google.com/books?id=UWYV5qYZ3-oC। আহৰণ কৰা হৈছে: 8 February 2012. Hatt, Christine (12 April 2002). Mahatma Gandhi. Evans Brothers. ISBN 978-0-237-52308-4. http://books.google.com/books?id=f6vvy-J7vhcC। আহৰণ কৰা হৈছে: 26 February 2012. Herman, Arthur (2008). Gandhi and Churchill: the epic rivalry that destroyed an empire and forged our age. Random House Digital, Inc.. ISBN 978-0-553-80463-8. http://books.google.com/books?id=tquxD6dk914C। আহৰণ কৰা হৈছে: 11 February 2012. Jai, Janak Raj (1996). Commissions and Omissions by Indian Prime Ministers: 1947-1980. Regency Publications. ISBN 978-81-86030-23-3. http://books.google.com/books?id=5Wrc1K0uJTgC। আহৰণ কৰা হৈছে: 26 February 2012. Jones, Constance; Ryan, James D. (28 February 2007). Encyclopedia of Hinduism. Infobase Publishing. পৃষ্ঠা. 160. ISBN 978-0-8160-5458-9. http://books.google.com/books?id=hZET2sSUVsgC। আহৰণ কৰা হৈছে: 13 January 2012. Kumar, Shanti (2006). Gandhi meets primetime: globalization and nationalism in Indian television. University of Illinois Press. পৃষ্ঠা. 170. ISBN 978-0-252-07244-4. http://books.google.com/books?id=abPsWgqrmMMC&pg=PA170। আহৰণ কৰা হৈছে: 14 January 2012. Lapping, Brian (1 January 1989). End of empire. Paladin. ISBN 978-0-586-08870-8. http://books.google.com/books?id=xBsiAQAAIAAJ। আহৰণ কৰা হৈছে: 16 January 2012. Lelyveld, Joseph (29 March 2011). Great soul: Mahatma Gandhi and his struggle with India. Random House Digital, Inc.. ISBN 978-0-307-26958-4. Majmudar, Uma (2005). Gandhi's pilgrimage of faith: from darkness to light. SUNY Press. ISBN 978-0-7914-6405-2. http://books.google.com/books?id=xM4paHEq5oQC। আহৰণ কৰা হৈছে: 12 January 2012. Miller, Jake C. (2002). Prophets of a just society. Nova Publishers. ISBN 978-1-59033-068-5. http://books.google.com/books?id=uiBNJWqtiVcC। আহৰণ কৰা হৈছে: 12 January 2012. Nayyar, Pyarelal (1956). Mahatma Gandhi—the last phase, Vol 1. Navajivan Publishing House. ISBN 0-85283-112-9. http://books.google.com/books?id=E8wBAAAAMAAJ। আহৰণ কৰা হৈছে: 16 January 2012. Pāṇḍeya, Viśva Mohana (1 January 2003). Historiography of India's partition: an analysis of imperialist writings. Atlantic Publishers & Dist. ISBN 978-81-269-0314-6. http://books.google.co.in/books?id=Vu2lu-ZI-vQC। আহৰণ কৰা হৈছে: 8 February 2012. Parekh, Bhikhu C. (2001). Gandhi: a very short introduction. Oxford University Press. পৃষ্ঠা. 6–9. ISBN 978-0-19-285457-5. http://books.google.co.in/books?id=0chB4q7XeHcC&printsec=frontcover#v=onepage&q&f=false। আহৰণ কৰা হৈছে: 17 January 2012. Pilisuk, Marc; Nagler, Michael N. (2011). Peace Movements Worldwide: Players and practices in resistance to war. ABC-CLIO. ISBN 978-0-313-36482-2. http://books.google.co.in/books?id=GTJV2UcZVHcC&printsec=frontcover#v=onepage&q&f=false। আহৰণ কৰা হৈছে: 21 January 2012. Rudolph, Susanne Hoeber; Rudolph, Lloyd I. (15 April 1983). Gandhi, the traditional roots of charisma. University of Chicago Press. পৃষ্ঠা. 48. ISBN 978-0-226-73136-0. http://books.google.com/books?id=JsPYNLAU9KYC&pg=PA48। আহৰণ কৰা হৈছে: 12 January 2012. Schouten, Jan Peter (30 September 2008). Jesus as guru: the image of Christ among Hindus and Christians in India. Rodopi. ISBN 978-90-420-2443-4. http://books.google.com/books?id=pIoKdTH7KPsC। আহৰণ কৰা হৈছে: 18 February 2012. Sorokin, Pitirim Aleksandrovich (March 2002). The ways and power of love: types, factors, and techniques of moral transformation. Templeton Foundation Press. পৃষ্ঠা. 169. ISBN 978-1-890151-86-7. http://books.google.com/books?id=DGCleCxTkbIC। আহৰণ কৰা হৈছে: 12 January 2012. Tendulkar, D. G. (1951). Mahatma; life of Mohandas Karamchand Gandhi. প্ৰকাশক Delhi: Ministry of Information and Broadcasting, Government of India. http://books.google.com/books?id=LHJuAAAAMAAJ. Thacker, Dhirubhai (1 January 2006). 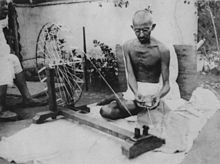 ""Gandhi, Mohandas Karamchand" (entry)". In Amaresh Datta. The Encyclopaedia Of Indian Literature (Volume Two) (Devraj To Jyoti). Sahitya Akademi. পৃষ্ঠা. 1345. ISBN 978-81-260-1194-0. http://books.google.com/books?id=zB4n3MVozbUC&pg=PA1345। আহৰণ কৰা হৈছে: 14 January 2012. Elst, Koenraad (2001). Gandhi and Godse - A review and a critique. প্ৰকাশক Delhi: Les Belles Lettres. ISBN 81-85990-71-9. Andrews, C. F. (2008) . "VII – The Teaching of Ahimsa". Mahatma Gandhi's Ideas Including Selections from His Writings. Pierides Press. ISBN 978-1-4437-3309-0. http://books.google.com/books?id=3EAV6JhQmgkC. Dalton, Dennis, ed (1996). Mahatma Gandhi: selected political writings. Hackett Publishing. ISBN 978-0-87220-330-3. http://books.google.com/books?id=afqmUWX5yeoC. Duncan, Ronald, ed (May 2011). Selected Writings of Mahatma Gandhi. Literary Licensing, LLC. ISBN 978-1-258-00907-6. http://www.questia.com/PM.qst?a=o&d=54615149. Gandhi, M. K.; Fischer, Louis (2002). Louis Fischer. ed. The essential Gandhi: an anthology of his writings on his life, work and ideas. Vintage Books. ISBN 978-1-4000-3050-7. Gandhi, Mohandas Karamchand (1928) (Gujarati ভাষাত) (paperback). Satyagraha in South Africa (1 সম্পাদনা). প্ৰকাশক Ahmedabad: Navajivan Publishing House. "Translated by Valji G. Desai" Free online access at Wikilivres.ca (1/e). Pdfs from Gandhiserve (3/e) & Yann Forget (hosted by Arvind Gupta) (1/e). 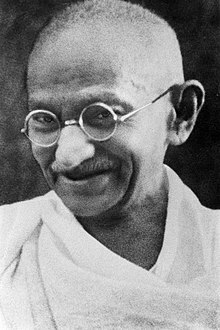 Gandhi, Mohandas Karamchand (1940). An Autobiography or The Story of My Experiments With Truth (2 সম্পাদনা). প্ৰকাশক Ahmedabad: Navajivan Publishing House. ISBN 0-8070-5909-9. Also available at Wikisource. Gandhi, Mohandas Karamchand (1928). "Drain Inspector's Report". The United States of India খণ্ড 5 (6,7,8): 3–4. Jack, Homer A., ed (1994). The Gandhi reader: a source book of his life and writings. Grove Press. ISBN 978-0-8021-3161-4. http://books.google.com/books?id=pjN3jZQ74AoC. Johnson, Richard L.; Gandhi, M. K. (2006). Gandhi's experiments with truth: essential writings by and about Mahatma Gandhi. Lexington Books. ISBN 978-0-7391-1143-7. http://books.google.com/books?id=dRQcKsx-YgQC. Parel, Anthony J., ed (2009). Gandhi: 'Hind Swaraj' and Other Writings Centenary Edition. Cambridge University Press. ISBN 978-0-521-14602-9. http://books.google.com/books?id=oc47gUOPZfcC. Keen, Shirin (Spring, 1998). "The Partition of India". Emory University. http://www.english.emory.edu/Bahri/Part.html। আহৰণ কৰা হৈছে: 16 January 2012. Sannuti, Arun (6 April 2010). 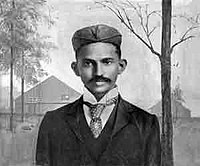 "Mohandas K. Gandhi (1869–1948) – Vegetarianism: The Road to Satyagraha". International Vegetarian Union (IVU). http://www.ivu.org/history/gandhi/road.html। আহৰণ কৰা হৈছে: 12 January 2012. Smith, Colleen (1 October 2006). "Mbeki: Mahatma Gandhi Satyagraha 100th Anniversary (01/10/2006)". Speeches. http://www.polity.org.za. http://www.polity.org.za/article/mbeki-mahatma-gandhi-satyagraha-100th-anniversary-01102006-2006-10-01। আহৰণ কৰা হৈছে: 20 January 2012. Sughosh, India (2 October 2010). "Bapu: Complete Life of Bapu". Life History. http://www.bapu.sughosh.in. http://www.Bapu.sughosh.in। আহৰণ কৰা হৈছে: 15 August 2012. Cribb, R. B. (August 1985). "The Early Political Philosophy of M. K. Gandhi, 1869-1893". Asian Profile খণ্ড 13 (4): 353–360. Hardiman, David (April 2001). "Champaran and Gandhi: Planters, Peasants and Gandhian Politics by Jacques Pouchepadass (Review)". Journal of the Royal Asiatic Society খণ্ড 11 (1): 99–101. Khan, Yasmin (January 2011). "Performing Peace: Gandhi's assassination as a critical moment in the consolidation of the Nehruvian state" (abstract). Modern Asian Studies খণ্ড 45 (1): 57–80. doi:10.1017/S0026749X10000223. http://journals.cambridge.org/abstract_S0026749X10000223। আহৰণ কৰা হৈছে: 21 January 2012. Mohanty, Rekha (2011). "From Satya to Sadbhavna". Orissa Review (January 2011): 45–49. http://orissa.gov.in/e-magazine/Orissareview/2011/Jan/engpdf/january.pdf#page=58। আহৰণ কৰা হৈছে: 23 February 2012. Murali, Atlury (January 1985). "Non-Cooperation in Andhra in 1920–22: Nationalist Intelligentsia and the Mobilization of Peasantry". Indian Historical Review খণ্ড 12 (1/2): 188–217. ISSN 0376-9836. Norvell, Lyn (1997). 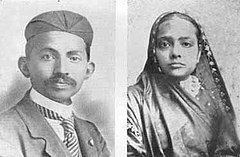 "Gandhi and the Indian Women's Movement". British Library Journal খণ্ড 23 (1): 12–27. ISSN 0305-5167. Prashad, Ganesh (September 1966). "Whiggism in India". Political Science Quarterly খণ্ড 81 (3): 412–431. Sarkar, Jayabrata (18 April 2006). "Power, Hegemony and Politics: Leadership Struggle in Congress in the 1930s". Modern Asian Studies খণ্ড 40 (2): 333–370. doi:10.1017/S0026749X0600179X. Sarma, Bina Kumari (January 1994). "Gandhian Movement and Women's Awakening in Orissa". Indian Historical Review খণ্ড 21 (1/2): 78–79. ISSN 0376-9836. Spodek, Howard (February 1971). "On the Origins of Gandhi's Political Methodology: The Heritage of Kathiawad and Gujarat". The Journal of Asian Studies খণ্ড 30 (2): 361–372. Ferrell, David (27 September 2001). "A Little Serenity in a City of Madness" (Abstract). Los Angeles Times: পৃষ্ঠা B 2. http://pqasb.pqarchiver.com/latimes/access/82514621.html?FMT=ABS&FMTS=ABS:FT&type=current&date=Sep+27%2C+2001&author=DAVID+FERRELL&pub=Los+Angeles+Times&edition=&startpage=B.2&desc=Surroundings%3A+Lake+Shrine%3B+%27A+Little+Serenity+in+a+City+of+Madness%27%3B+Meditation+Gardens+in+Pacific+Palisades+Are+a+Place+to+Walk%2C+Think+and+Pray। আহৰণ কৰা হৈছে: 14 January 2012. Ramesh, Randeep (16 January 2008). "Gandhi's ashes to rest at sea, not in a museum". The Guardian (London). http://www.guardian.co.uk/world/2008/jan/16/india.international। আহৰণ কৰা হৈছে: 14 January 2012. Roberts, Andrew (26 March 2011). "Among the Hagiographers (A book review of "Great Soul: Mahatma Gandhi and His Struggle With India" by Joseph Lelyveld)". BookShelf (Wall Street Journal). http://online.wsj.com/article/SB10001424052748703529004576160371482469358.html। আহৰণ কৰা হৈছে: 14 January 2012. Unattributed (31 January 1948). "Of all faiths and races, together they shed their silent tears". The Indian Express: পৃষ্ঠা 5 (top centre). http://news.google.com/newspapers?id=4cU-AAAAIBAJ&sjid=nkwMAAAAIBAJ&pg=2964%2C2759742। আহৰণ কৰা হৈছে: 19 January 2012. Unattributed (1 February 1948). "Over a million get last darshan". The Indian Express: পৃষ্ঠা 1 (bottom left). http://news.google.com/newspapers?id=4cU-AAAAIBAJ&sjid=nkwMAAAAIBAJ&pg=2273%2C2717510। আহৰণ কৰা হৈছে: 19 January 2012.